Casino Extreme: A Great Destination for Regular Rewards? Casino Extreme has been in the online casino industry since 2000. It operates under Anden Online N.V., which is under the laws of Curacao. While the betting hub’s license does not hold as much weight as a license in Malta, it at least shows that the casino’s operators exercised due diligence in order to operate. However, keep in mind that you will not get help from the Curacao regulation office if you have a dispute with the casino. 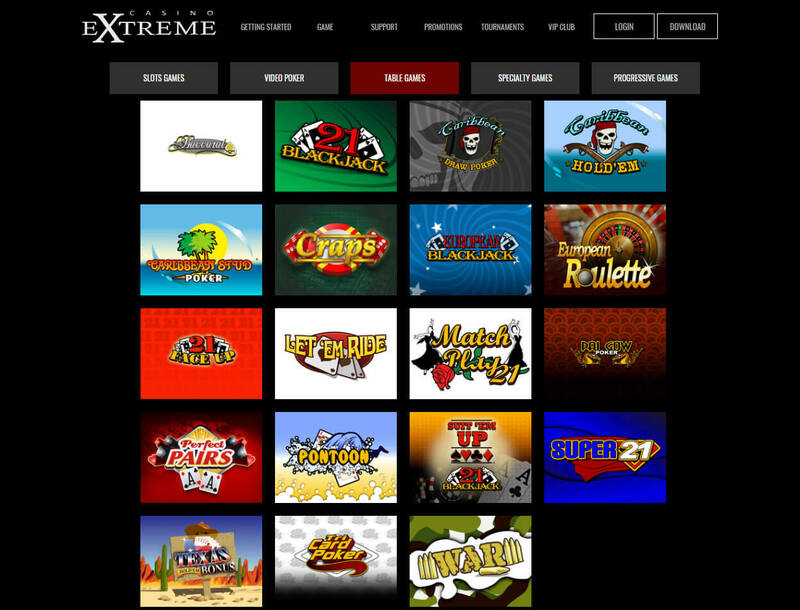 Since its launch, Casino Extreme has been constantly improving to bring in new players and to retain loyal customers. On top of offering an excellent selection of games, the casino also gives rewarding bonuses. Plus, the betting site extended its payment options to include Bitcoin and other altcoins for quick and easy transactions. 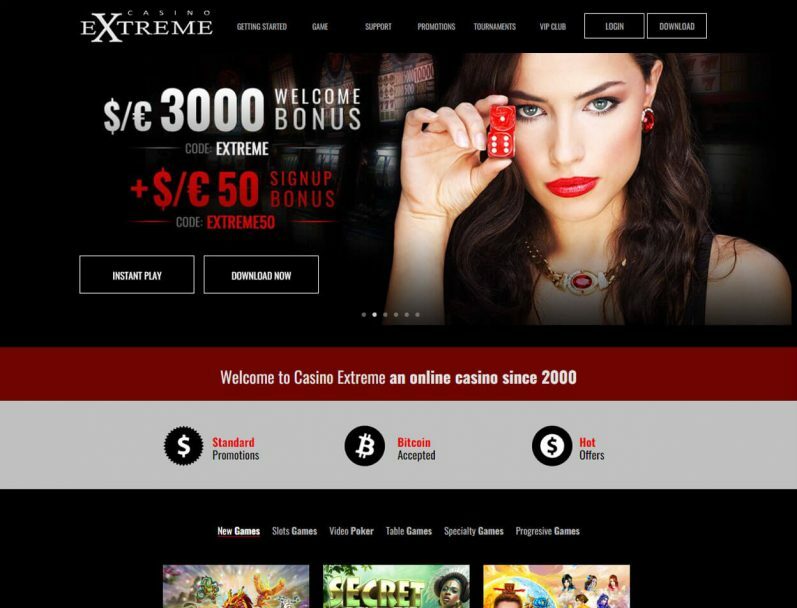 Before you sign up, you must first check whether you can create an account with Casino Extreme. Fortunately, you can sign up if you are in the United States or the United Kingdom. Still, to avoid legal issues, make sure to join the gaming hub only if you are allowed to bet with real money in your country. Once you join Casino Extreme, you can make the most of the wide selection of bonuses and promotions. Fortunately, the casino is generous with their freebies, which means you can explore the game library with more cash on hand. Here are the following rewards you can claim on the betting site. You do not need to make a deposit before claiming a bonus. Simply redeem a code, and Casino Extreme will give you a €50 bonus. Keep in mind, though, that you must wager your deposit and bonus 40 times before you can get your rewards. After using your Sign-Up Bonus, you can use the Welcome Bonus, which is good for your first six deposits. Just key in a one-time code and fund your account with at least €20. After that, the casino will send a 100% bonus up to €500 to your account. Make sure to meet the 15x rollover requirement before you make another deposit and claim the next deposit bonus. By your sixth deposit, you can get up to €3,000 in free cash. There is no need to worry if you drained your deposit balance while playing on the betting site. With Extreme Cashback, Casino Extreme will credit back 20% of your lost deposits the following day. The good news is this deal does not have a wagering requirement. However, take note that the following games are not eligible for the cashback: baccarat, craps, roulette, and sic bo. And if you bet any amount on blackjack, you will receive only 10% of your lost deposit back. As your VIP level increases, your benefits increase as well. Some perks you will receive include monthly free chips, increased withdrawal limits, and more comp points convertible to cash. Meanwhile, Double Diamond members get treated to an annual holiday worth €20,000, courtesy of the gaming hub. The rewards you will get on Casino Extreme do not stop with these bonuses. The casino also boosts your account with bonus money if you deposit using e-wallets or Bitcoin. Plus, the betting site hosts daily promos that give you extra cash and Bitcoin free spins. With so many incentives in store, you have a reason to play every day. 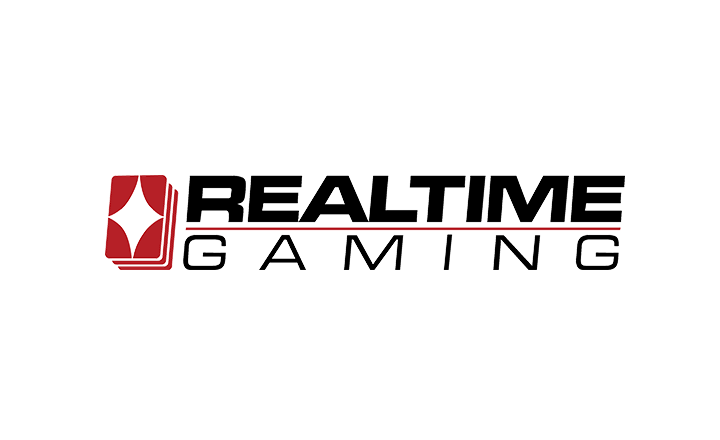 Casino Extreme is powered by RealTime Gaming, which means most of the games in the collection are from this provider as well. The casino gives you the option to play using instant play, downloadable software, or mobile version. No matter what mode you choose, you will get access to almost 300 titles that you can play for fun or for real. Additionally, these games were tested by Gaming Laboratories International. This means you can be sure that the gaming hub will not manipulate game results. 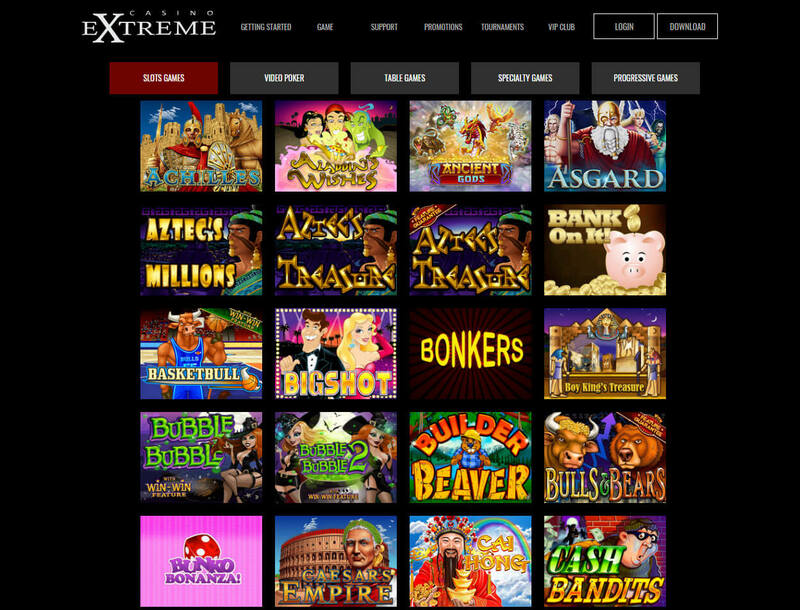 Despite the many categories to choose from, Casino Extreme’s focus is mainly on slot games. Some of the popular titles are Aladdin’s Wishes, Builder Beaver, and Food Fight. But if you want more than just action on the reels, you can play progressive jackpot slots such as Aztec’s Millions and Cleopatra’s Gold. Besides having in-game rewards, these titles give you a chance to hit a huge cash prize. Apart from slot games, the casino has a modest collection of traditional table games. You can play variants of baccarat, blackjack, and roulette in both regular and progressive versions. The betting site also has you covered with its video poker titles and specialty games such as bingo, dice, and keno. The only section you will find missing is a live casino. However, this should not be an issue if you do not mind not betting against a live dealer. Casino Extreme offers a reasonable amount of payment methods. Plus, the gaming hub accepts BTC, BCH, ETH, USD, and EUR. Keep in mind, though, that you need to pick your preferred currency before signing up with the casino. Take note that the minimum deposit amount is €20 for all payment methods. Once you have made a deposit, Casino Extreme will credit the funds to your account right away. Unfortunately, you have fewer withdrawal options. If you are using credit or debit cards to make a deposit, make sure to choose an alternative cash-out method. But if you are holding crypto coins, just key in your wallet address in the Cashier section. Make sure to cash out at least €20 from your account. If you withdraw using cryptocurrency or e-wallets, expect to receive your winnings right away. But if you chose bank wire transfer as your payout option, you will get your money within two to five working days. If you are looking for a great place to play Bitcoin slots, you should consider signing up with Casino Extreme. While you can play only a few titles, you will get more cash on hand from the casino’s generous bonuses. Plus, the gaming hub offers an excellent VIP program. In addition, you can choose various banking options and enjoy near-instant payouts.